Asmaa Azaizeh received her BA in Journalism and English Language from Haifa University in 2006. She won the Young Writer Award from Al Qattan Foundation in 2010 for her first volume of poetry, ”Liwa”, which was published in 2011. While the second poetry collection ”As The Woman From Lod Bore Me” was published in 2015, and it was launched through a poetry show (where various fields of arts presented the text on stage). She has also contributed to and participated in various journals, anthologies and poetry festivals. Her work has been translated into English, German, French, Persian, Swedish, Spanish, Dutch, and Italian. Asmaa has also worked as a journalist and presenter in various TV and radio stations. 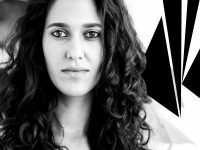 Currently, she works as a freelance writer for cultural magazines, a curator at Fattoush art space and bookshop in Haifa, and a manager of the poetry initiative “Poetry Lab”.